I’ve received a couple of emails from collectors querying the cause of erratic second sweeps that appear to “stick” and then jump forward or that have a very jerky action. In both cases, the movements themselves were keeping reasonable time. So what could be the likely cause of the problem? The answer to that question lies in Omega’s preference for an indirect centre seconds design that was a trademark of Omega movements at the time. Even the last in-house 1000 series automatic movements featured indirect centre seconds. Omega saw a number of advantages in isolating the seconds gear from the power train - one being it facilitated the placement of the balance wheel close to the rim of the plate, offering better visibility and access. The process is explained by the above picture which you can click on to enlarge. The sweep seconds pinion A (removed and placed on the main movement plate) passes through the centre wheel at location B. The third wheel C drives the pinion A. Resting on the pinion A is the sweep seconds friction spring D. The friction spring D in the picture has been rotated away from the position B where it belongs. Follow the arrow in the picture to see where the friction spring sits. The problem of jerky or stop-start movement of the second sweep is caused by the friction spring either being in need of some adjustment or replacement. The friction spring stabilises the sweep second hand motion preventing the jerky action that is caused by play between the teeth of the third wheel and those of the sweep second pinion. A faulty friction spring allows the play to occur. Taking the watch to a watchmaker who has long experience of Omega movements and plenty of parts movements available is probably the best option. My watch guy said I needed one of these for my vintage Mido (1943?)... had the jerky motion you describe on the second hand. He showed me a straight piece on his bench and said it was similar to what i needed. He said i needed a Felsa 177, but when I found one on the 'net and ordered it I got a curly thin hairspring (i think that's what they're called.) Is this the wrong part? Thx. 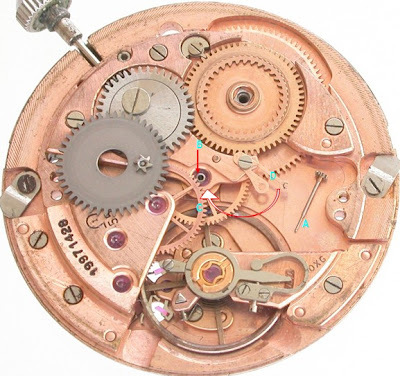 G.
Hmm, yes if you got a hairspring then that wont do as that is part of the balance. The friction spring is indeed a flatish elongated part in most instances. gears and the sweep pinion. The friction spring could well be the problem. I think a visit to an independent watchmaker (rather than an Omega service agent that will cost the earth) would be advised sooner rather than later. Yes, it is a feature of the 1000 series. The automatic winding system requires fairly robust wearing. I recall years ago that one observation in respect to this series was that sedentary people were complaining of lower power reserve. The power reserve capacity is there, but it requires a lot of movement to fully power the watch up.